There are so many fun and exciting things to do on your next trip to the Eastern Shore. From discovering history in area museums to hanging on the beach and going on a wine tour, there is truly something for everyone! Whether you are planning a romantic weekend getaway or a family-friendly vacation Eastern Shore has what you are looking for. Start planning your activities today so when you arrive you can relax, kick back and enjoy! 1. Chesapeake Bay Maritime Museum Visit this stunning campus in the heart of St. Michaels to enjoy a host of permanent exhibitions celebrating our maritime heritage. You can also rent boats, plan an overnight in the lighthouse, and stroll nearby for crabs at the iconic Crab Claw or take a sightseeing cruise on the Patriot. Any visit to St. Michaels should begin with this! 2. Chesapeake Wine Trail Our warm days and cool nights, moderated by the Chesapeake Bay, create ideal conditions for a growing wine industry. Take in some of the charming boutique wineries, coupled with beautiful scenery. A great chance to learn about wine production and sample something to savor with that freshly caught seafood! 3. Blackwater National Wildlife Refuge Often referred to as "the Everglades of the North", Blackwater contains one-third of Marylands tidal wetlands, and it's expansive habitat is home to the largest population of the formerly endangered Delmarva Fox Squirrel as well as one of the largest breeding grounds for Bald Eagles on the East Coast. There is a myriad of nature observing opportunities! For a seasonal list click here for more information. 4. Oxford Bellevue Ferry Take a visit to historic Oxford and be sure to take a ride on the Oxford Bellevue Ferry. The oldest privately owned ferry in America is on it's 332nd year of crossing the Tred Avon River from Oxford to Bellevue. A great way to cut some distance from Oxford to St. Michaels, but also fun for children to experience the Ferry and the scenic ride. Open seasonally. 5. Food, Glorious Food! There are too many restaurants to name just one here, but definitely bring your appetite along when you visit MD's Eastern Shore! We have an array of world-class dining venues, coupled with eclectic lunch and coffee spots. Click here for a guide to our favorites or contact us for suggestions. We love to talk food! 6. Dogwood Harbor A great place to learn about the heritage of Chesapeake Bay watermen. Book a cruise aboard the Rebecca T Ruark, a 100+-year-old working skipjack and learn the fascinating history of the area by a third-generation resident, or climb aboard The Lady Patty for a taste of "the golden age of American yachting". 7. The Schooner Sultana Absolutely take advantage of one of the public sails on the Sultana in Chestertown. The Sultana is a reproduction of a Boston-built merchant vessel that served for four years as the smallest schooner ever in the British Royal Navy. Manned by a 25-person crew, the original Sultana patrolled the coastline of colonial North America from 1768 to 1772 enforcing the hated Townsend Acts or “Tea Taxes.” A key factor that led to Sultana’s selection for replication was the wealth of primary documentation from the original vessel that was preserved by the British Navy. Sultana’s reproduction is based directly on a 1768 Royal Navy survey of the original schooner, making it one of the most accurate 18th-century replicas in the world today. 8. Get Active! Vacationers looking to stay active while visiting the area will find many great options for staying in shape. Top rated cycling trails, paddleboard and kayak rentals, and scenic running trails are all waiting for your next challenge! Also new for 2017, ESVR is offering Peloton bike rentals in select properties so you can continue your quest to 100! We are also home to many challenging and fun athletic events, click here for more information! 9. Fall Fun Unlike other resort areas that go to sleep after Labor Day, the Eastern Shore is brimming with activity year round! Fall is one of the best times to visit our area with cooler temperatures, fewer crowds, great in-season produce and seafood, and the fall colors and migratory birds set the scene for a memorable weekend getaway. Festivals such as The Waterfowl Festival, WineFest, The Chesapeake Film Festival and OysterFest all lend themselves to an enjoyable weekend celebrating the finest the area has to offer. For a schedule of all local events click here. 10. Nothing at all. Doing nothing has never been so fun! Unwind in one of our waterfront cottages or homes, and simply let the Chesapeake Bay breezes wash over you. 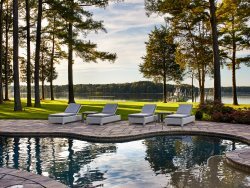 Enjoy a lazy day by the pool, watch sailboats float by on the water, and just savor the quiet, relaxed ambiance that is the Eastern Shore.